InSanity lurks Inside: Dark Horse Comics looses Star Wars as Disney moves it to Marvel. Dark Horse Comics looses Star Wars as Disney moves it to Marvel. 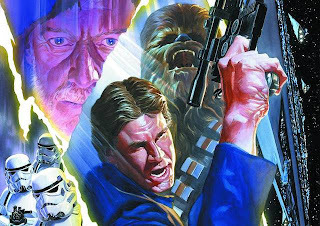 Reports are flying left and right this morning- Dark Horse Comics has announced that they are loosing the "Star Wars" comic book series today. In a not-really-surprising-at-all move, Disney has yanked their two newest cash-cows together. They are moving "Star Wars" comic books to Marvel, double the profit on both ends. It shows an end of an era in comic books as Dark Horse has been publishing the SW comics for more than twenty years. The license ends in 2015 when the move will be official, giving Dark Horse just a year to wrap up their current storylines with the various artists and writers. In a big ol' press release, Marvel states how happy they are about getting "Star Wars". However, I think I09 summed it up much better in their piece.